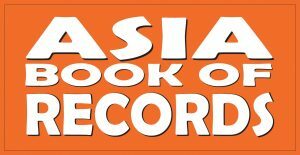 Licensing the Asia Book of Records ® logo before, during and after a successful record attempt position your brand in the list of the leading players in their own sector of industries. •The licensee is eligible to use the Asia Book of Records logo in their printing material, such as newspaper advertisements, letterheads, visiting cards, imageries, stationeries, pamphlets,banners etc. •The licensee will be given 50 Asia Book of Records badges so that they can facilitate the record breaking team with it.